by Emma | Apr 26, 2017 | allotment, books, environment, What can I do? A lot of new gardening and plant books have landed on my mat this spring, and I need to up my book reviewing game! I like to do them justice, and spend some time reading them before I write a review, so that does create a bit of a backlog. Right at the time when the garden is demanding my attention. Anyway, the book that has found itself at the top of the list is one that really encompasses the gardening zeitgeist – The Community Gardening Handbook, by Ben Raskin. I looked him up, and he has impeccable credentials. He’s currently Head of Horticulture for the Soil Association; prior experiences include working for Garden Organic, running a walled garden and being a Horticultural Advisor for the Community Farm near Bristol. 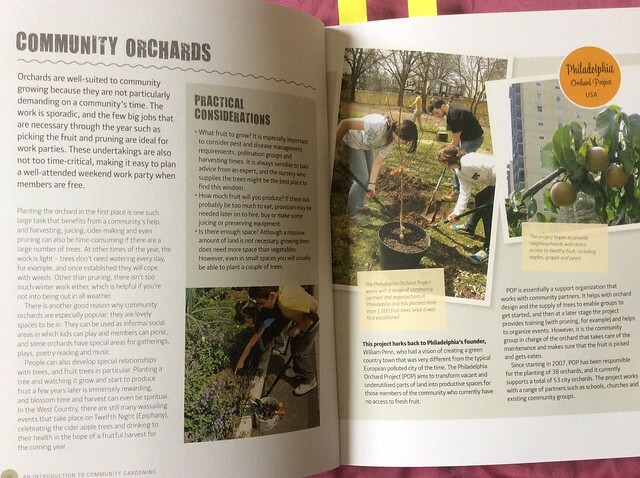 In The Community Gardening Handbook, Raskin has put together a manual for people who want to get involved in kitchen gardening in a group context, whether that’s as an individual tending an allotment, a guerilla gardener, or the founder of a community orchard. After a brief introduction, extolling the virtues of gardening (with which I am sure we are all familiar), the author explores the different options for community gardening. There’s an international flavour, so the options for people who want an individual plot to tend include allotments, community gardens and victory gardens; the examples given are from Germany and Spain. Upping the level of community engagement, he moves on to shared plots, where the work and the harvests are divided between members. These include community orchards, where – if you can sort out long-term tenure – a community group can reap large harvests with minimal regular effort. Fruit trees need the kind of care and attention that lends itself well to work parties, an agricultural tradition that blends hard work and fun and binds people together in a way we rarely see these days. Orchards are also, the book reminds us, lovely places to hang out. They are valuable community spaces throughout the year – fruit isn’t their only harvest. There are sections on animals in community gardens, involving children, community supported agriculture (a concept that has yet to take off in the UK, as far as I am aware) and ideas for people with no land, including pop up gardens and guerilla gardening. Chapter one ends with a quick glance at the various community gardening networks, and the therapeutic benefits of community gardening. Chapter two turns its attention to the nitty gritty of starting, and maintaining a community garden project. It includes practical information on how to run a public meeting, building a team, raising funds, the necessary legal bits and pieces to bear in mind. There’s a nice section on some of the events you might like to hold in your community garden, from seed swaps to skill-sharing. Chapter three is even more practical, starting with planning and planting, and moving on through watering and soil improvement to building sheds and composting. You’ll find the basics of seed sowing, seed saving, crop rotation and pest control alongside handy seasonal task lists. Chapter four is the plant directory, providing the low-down on growing a wide variety of crops, including popular vegetables, fruits and herbs, together with edible flowers and ‘perennials and bulbs’ – both edible and purely ornamental. The book draws to a close with an index and acknowledgements; its only lack, perhaps, is any mention of suppliers. 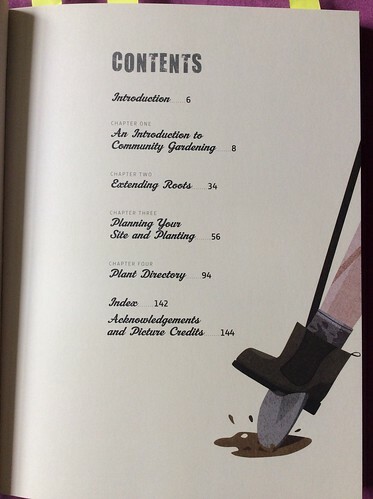 I can imagine copies of The Community Gardening Handbook will rarely find themselves on bookshelves. Their destiny is to be passed from hand to hand in community gardening groups (both well-formed and primordial), getting every grubbier as the plant directory informs each new generation of planters. It doesn’t go massively into the details of any given subject, but it’s enough to get you started and point you in the right direction, and it’s clear and friendly layout evokes the very spirit of community gardening. I was provided with a review copy of the book by the publisher, Leaping Hare Press. Rather than letting it languish on my bookshelf, I’m going to pass it on to Incredible Edible Didcot, where I hope it will have a long life and fruitful informing public edible plantings. 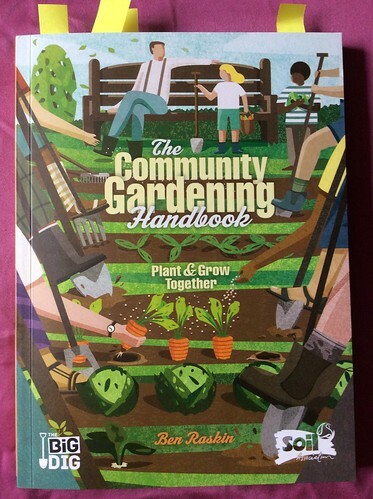 The Community Gardening Handbook has an RRP of £9.99, but is currently available for £7.59 via Hive the online book store that supports your local bookshop. You can choose free home delivery, or pop in and collect your book. I haven’t tried it myself yet, but I’m going to give it a go next time I’m in the market for a book. And they’ve got a sale on gardening books at the moment! Have you tried Hive?